We know how important your web site is. It's a gateway for new parents to let them find out more about you, it's a place where parents can read the latest news. It can provide a secure photo gallery for parents to log in and see pictures of the activities going on this week. 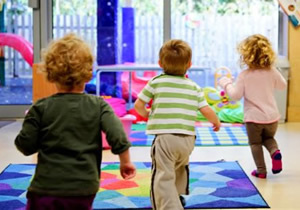 One of the most important things that your web site needs to do is promote your nursery online so that you are the first choice for parents looking for a nursery. This means that as well as having a great design, your nursery web site also requires search engine optimisation so that your nursery comes above the rest in Google's search results when parents search for 'excellent nursery'. Each of our web sites are developed to ensure you get the web site that's perfect for you. We have brief chat with you about the features that you would like on your web site. We then go and put a design together which we send to you as a picture. If you like the design, that's what we base the new web site on. If you don't, we put another design together, and another, and we keep doing this until we find the design that's perfect for you. We will create an unlimited number of designs for you to ensure that you are completely happy with the end result. Latest news - post news on a regular basis about what's on the curriculum this week or an up coming fund raiser. We are happy to add any other features to your web site. If you have an idea, just let us know and we will tell you if we can do. All of our nursery web sites are priced at just £14.99 a month. This is fully inclusive of your web site address, hosting, updates and unlimited support. The design and maintenance of your site is also included in the fee, as is the search engine optimisation. We do not charge a sign-up fee either. Everything is included in the low monthly cost. We find that the lease model works much better for schools because there is not a large up-front fee. We are very flexible with payment. Just choose the option that's best for you. Either: PayPal, debit card, credit card, bank transfer or cheque. There are no contracts involved so you can cancel with us at any time. If you are ready to sign-up and get your new web site developed, please click here.